Bryce Harper is having a career year emerging as one of baseball’s elite players. He leads all qualified batters in Major League Baseball in wins above replacement (WAR), weighted on-base average (wOBA), isolated power (ISO), and weighted runs created (wRC+). Harper has a wRC+ of 223, which means he’s created 2.23 times as many runs as the league average. wRC+ compares players to the rest of the league, because the stat is calculated relative to the league average. I created a few interactive histograms to place a few of Harper’s stats in more context. For those who are not entirely familiar with histograms, they show the distribution of a particular stat. A narrow distribution has individuals clustered closer together, while a wide distribution has individuals that differ more. You might be familiar with the ubiquitous bell curve – the normal distribution. Histograms are important because they can provide a lot of information about the league quickly. While the wRC+ stat tells you how much better than league average the player is, it doesn’t tell you how many other players did as well. The following is a Tableau interactive, which includes qualified batters across both leagues. There are two tabs: one for rate stats like wOBA, AVG, ISO, and BABIP and one for accrued stats like WAR, stats which have a different scale like wRC+, and I even put home runs (HR) in there as well. 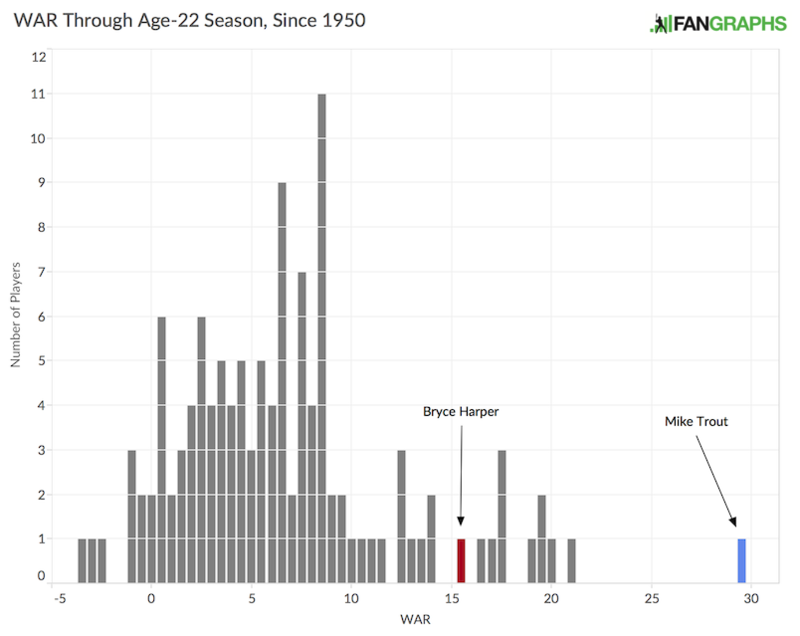 Harper is highlighted red where he falls within each histogram. Data is limited to batters had enough at-bats to qualify for the batting title on 7/6/2015. All data is current to that date as well. For most stats, Bryce Harper is quite the outlier – his stats are well beyond the rest of MLB. He has of wOBA of almost .500 and his ISO is higher than most players’ batting averages. While Harper has been an outlier the first half of 2015, his career WAR through his age-22 season (2015) has been good, but he is still trailing Mike Trout by about 15 wins. Granted Harper still has to finish this season, but he is highly unlikely to get to Trout’s WAR totals. EDIT: wRC+ is a relative rate stat. The post originally stated wRC+ was accrued. It remains on the visualization as such due to technical reasons. We hoped you liked reading Bryce Harper in Graphs by Sean Dolinar!